Zürich is the largest city in Switzerland. Situated at the northern end of Lake Zürich it has an important commercial centre, some industry in the suburbs and a new commercial development not far from the centre called Zürich West. It is a very hilly city with most of the one metre gauge tramway system on street track which opened in 1892. 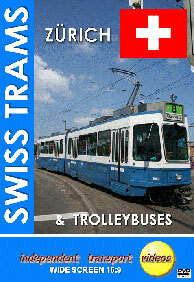 The tram fleet is operated by ZVV, and the trams are based on the Swiss Standard cars with articulated versions derived from that type with low-floor sections added, as well as non-driving cars. They are known as the ‘Tram 2000’ class and were introduced in 1976 and continued to be built until 1992 by either Schlieren or Schindler. New cars are known as the ‘Cobra’ class, manufactured by Bombardier and are 100% low floor. The fleet is immaculate and is painted in a blue and white scheme which is the same as the colours of the Swiss canton where Zürich is situated. We also see Cobra trams in the white and blue colours of the Glattalbahn which is owned by Verkehrsbetriebe Glattal (VBG), but is operated by the Zürich tram operator (ZVV). This line opened in 1908. Another system we see operating in the eastern part of the city is the Forchbahn (FB) light rail. Running to Forch and Esslingen in a red and cream livery the cars are built by Stadler. Our filming starts in Bellevueplatz, a busy interchange near to Lake Zürich where we see most types running in service in beautiful sunny weather. From here we move along to Quaibrücke, Bürkliplatz, Bahnhofstrasse and Paradeplatz to the very busy Bahnhofplatz opposite the railway station. Our cameras board tram 2100 for service 6 to the Zoo. There are interesting views from the tram as it climbs its way to the small terminus at the Zoo. We return this time to Central on board tram 2101, also on route 6. Filming continues at Central as we move along to Bahnhofbrücke and to Goethestrasse where we witness the ‘FB’ light rail cars in service. Our next ride is from Zürich West on board tram 2064+2402 on service 4 to Limmatquai. We then journey to Albisriederplatz with a driver’s eye view of route 2 on board Cobra 3012. Turning our attention to the trolleybuses in Zürich, we take a ride on route 33 from Bahnhof Tiefenbrunnel to Albisriederplatz on board an articulated Hess Swisstrolley 3 BGT-N2C, fleet number 158. This superb trip covers the long route through the suburbs of Zurich passing a number of the older Daimler-Benz O405 GTZ vehicles as well as sharing the road with many trams. Züri Fäscht is a festival that takes place in July. There are many special tram workings during the festival due to roads being closed off for stalls of food and drink as well as bands playing music etc. We have filmed at a number of locations over the city to record this happy event. Our final scenes are at the superb Zürich tram museum at Burgwies that can be reached on either a ZVV tram or FB light rail. We hope you enjoy this visit to Zürich!